We're proud to be able to provide you with a Gilmour Black Strat® inspired complete pickguard assembly that is the most authentic of all replica's being built. 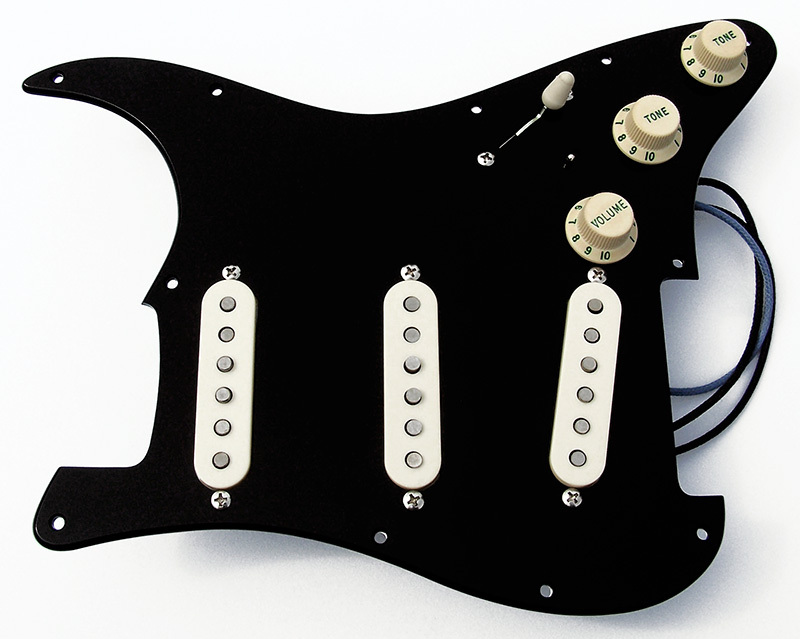 Feature for feature you will not find a Gilmour Black Strat® inspired pickguard assembly as authentic as ours. We realize there is a lot of information provided for this Gilmour Black Strat® inspired pickguard assembly, but it is necessary in order to accurately describe all the features and options that can go into constructing an authentic assembly. So take your time to review our in-depth details, descriptions and specifications we've outlined below and you'll understand the attention to detail we've taken with every aspect of the project to provide you with an authentic replica of the Gilmour Black Strat® pickguard assembly that you will be proud to own. Complete guitar shown in photographs is for illustration purposes only and depicts our complete Black Strat® pickguard assembly as installed in a complete guitar. For a limited time we will offer the DiMarzio FS-1 bridge pickup for those wanting to replicate Gilmour's tone from early 1976 through late 1979 as used in the recording and touring of the Animals album, the recording of The Wall album and the recording of Gilmour's 1978 solo album. Exclusive To OverDrive Custom Guitar Works - We have the original Seymour Duncan Custom Shop Hand Scatter-Wound SSL-1C DG pickup and we also have a unique variant of the SSL-1C DG pickup in a Reverse Wind / Reverse Polarity (Rw/Rp) version which will give you two pickup selection positions of hum cancelling. With the SSL-1C DG Rw/Rp there is no difference in tone, output, harmonics or sustain, just a modern hum-cancelling improvement over the original SSL-1C DG pickup. full details below. Either of these SSL-1C DG pickups require a $71.00 upcharge that is selected and paid for additionally below. Black Strat Electronics Analysis: Be sure to read our detailed technical comparison we performed with the Relic and NOS Fender Custom Shop Gilmour Black Strat electronics in relation to our custom Black Strat pickguard assembly. Read the full article here. We have compiled a detailed information page specifically about our two Seymour Duncan Custom Shop SSL-1C DG pickups, read the article here. Depicted above is the Combination Accessory Color set including the "Add On" assembly upgrade option of the Green Lettered and Numbered knob set. The combination accessory option includes Aged White knob set, Parchment pickup covers, Parchment switch tip and Parchment tremolo arm tip. This accessory color selection and style that is the same as what is found on the Fender® Custom Shop Relic Black Strat. Every component of our Gilmour Black Strat® inspired p1ckguard assembly has been researched in detail to provide you with a truly authentic assembly from the correct pickup selections to the high quality craftsmanship in the unique custom manufactured Black 1 Ply 0.120" Acrylic Rounded and Polished Edge Pickguard along with the correct implementation of the recessed mini-toggle switching system. We build each assembly by hand using high quality parts such as Fender, Seymour Duncan, DiMarzio, CTS, CRL and Orange Drop polyester film tone capacitors. We also offer you with a number of alternate customization options to the original design to further enhance your pickguard assembly without compromising that great Gilmour tone. With this item purchase you will receive a complete Gilmour Black Strat inspired pickguard assembly with genuine Fender® Custom Shop, Seymour Duncan or DiMarzio pickups of your choosing with everything installed, wired and soldered in place, ready to drop in your favorite Strat® by simply connecting the audio and ground wires. The pickup covers, knobs, switch tip and tremolo arm tip can be selected as White, Parchment, Aged White, Black or even a Combination of Parchment and Aged White (described in detail below), and all are genuine Fender® accessories. We include our own custom manufactured Gilmour style 4-¼" tremolo arm along with a set of GHS Boomers David Gilmour Signature Series Strings, a Switchcraft USA 1/4" output jack along with all the mounting screws. We also offer the option to select from 24 alternate pickguards that differ from the authentic Black 1 Ply 0.120" Acrylic Pickguard with the Rounded and Polished edge. These alternate pickguard selections are for those that want the awesome Gilmour tone, electronics and the unique recessed mini-toggle switching system but don't want the same visual appearance. This custom pickguard assembly no longer has to look like the famous Gilmour Black Strat, it can now be assembled visually different and customized for your particular Strat's® color theme but will still have the same awesome tone. Some of the unique features of this assembly is our own custom manufactured Black 1 Ply 0.120" Acrylic Pickguard with the Rounded and Polished Edge along with the correct implementation of the recessed mini-toggle switching system. 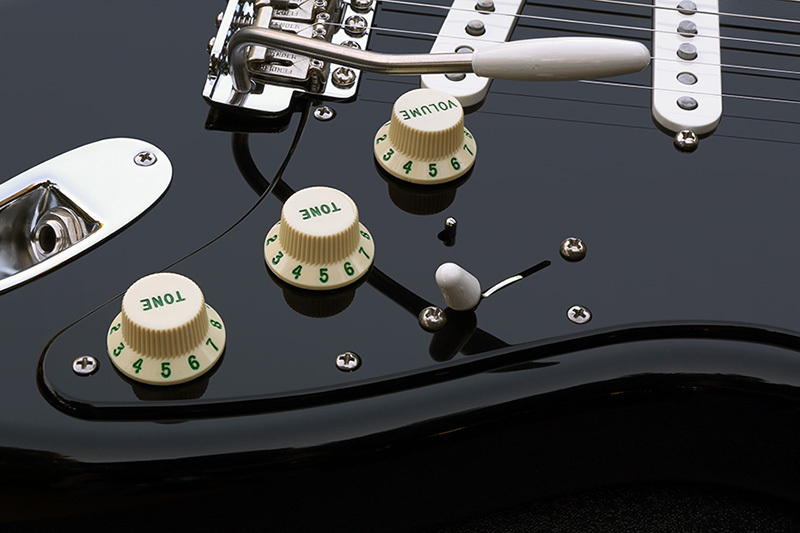 The recessed mini-toggle switching system is a unique feature that is synonymous with the Black Strat. With our pickguard assembly no modifications are required to your Strat® body, it's a "drop-in" unit that only requires you to solder the wires to the output jack and the tremolo claw that on average takes about 30-45 minutes to complete. The function of the recessed mini-toggle switch is to activate the neck pickup, the "on" position is down when the guitar is in the playing position. By activating the mini-toggle switch with the 5-way selector switch in position 1 (bridge pickup) then you will have the bridge and neck pickups selected together in parallel. By activating the mini-toggle switch when the 5-way selector switch is in position 2 (bridge and middle pickups) then all three pickups selected together in parallel. This gives you a total of 7 unique pickup selections. Before we build each pickguard assembly we test every single component to verify they are within specified tolerances and that they operate correctly. After each pickguard assembly is built it is then fully tested as a complete unit to ensure correct operation, that way we know 100% for sure it will work perfectly when you install it in your guitar. Complete component and final assembly testing results are provided with each pickguard assembly. Above is a video from one of our customers who has installed our complete Gilmour Black Strat® inspired pickguard assembly in his Strat®. Pickups installed are the Seymour Duncan Custom Shop Hand Scatter-Wound SSL-1C DG (Original) in the bridge position, Fender® Custom Shop Custom '69 in the middle position, and a Fender® Custom Shop Fat '50 in the neck position. Complete pickguard assembly shown with the Combination selection of Accessory Colors with aged white control knobs, parchment pickup covers and parchment switch tip along with the optional pickguard assembly upgrade of the Customized Green Lettered & Numbered knob set. Back side of the complete pickguard assembly. Details of components, wiring and the standard included control region copper foil shielding. CTS 450G series 250k audio taper potentiometers (10% tolerance), CRL 5-way selector switch, Salecom mini-toggle switch, "Orange Drop" polyester film 0.047 uF tone capacitor and our custom manufactured stainless steel recessed mini-toggle switch mounting bracket. All interconnect wire is UL1007, 300v, 22 gauge pre-tinned copper, PVC insulated. Close-up detail of the recessed mini-toggle switch. Notice the implementation of the mini-toggle switch and the very small slot in the pickguard that allows the toggle lever to protrude through. Also shown are the optional pickguard assembly upgrade of the customization of the installed knob set with the Dark Green Letters and Numbers which is selected and paid for additionally below in the amount of $25.00. 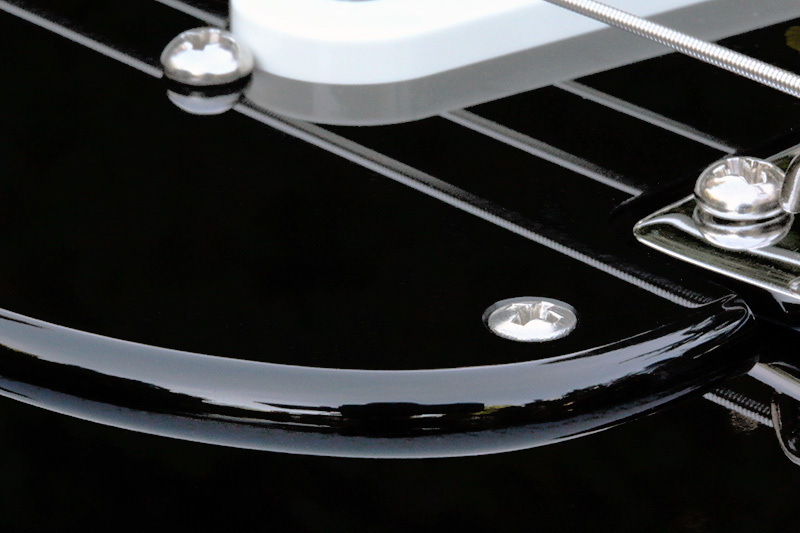 The above two photographs show close-up detail of the Rounded and Polished Perimeter Edge of the Black 1 Ply 0.120" Acrylic pickguard. A very nice, unique and authentic original feature of the Black Strat. The rounded and polished edge is only available on our Black or White 1 Ply 0.120" Acrylic pickguards. Also shown are the optional pickguard assembly upgrade of the customization of the installed knob set with the Dark Green Letters and Numbers. Shown without the cloth tape wrapped coil which all our current production SSL-1C DG pickups now have. The above Seymour Duncan Custom Shop SSL-1C DG (original) pickup is hand scatter-wound the same as Gilmour's original SSL-1C using the same winding wire and beveled Alnico 5 pole pieces. 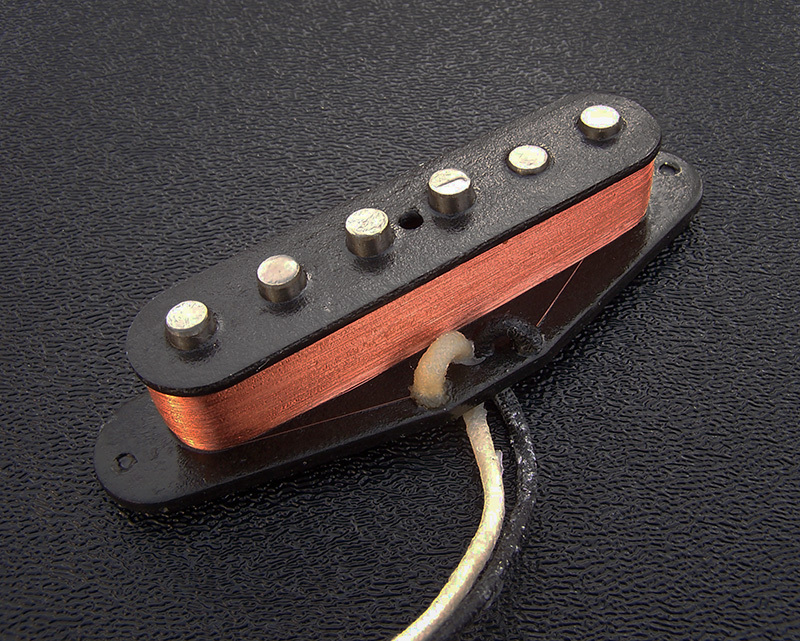 This pickup has the high output, sustain and harmonics similar to an SSL-5 with an average rated DC resistance of 12.9k. To select this pickup for installation in your assembly you will be prompted in the drop down menu selection for the bridge pickup to include "Add On" option #2 which has an up-charge of $71.00. This is a very special pickup that you will not find anywhere else. The SSL-1C DG pickup is now available in a Reverse Wind / Reverse Polarity (Rw/Rp) version to give you hum cancelling capabilities when the bridge and middle pickups are selected together and also when the bridge and neck pickups are selected together with the recessed mini-toggle switch. There is an up-charge of $71.00 to have the SSL-1C DG Rw/Rp (Reverse Wind / Reverse Polarity) pickup installed, it requires including "Add On" option #1 below the main pickguard selection options. Each of our complete Black Strat® pickguard assembly packages include a set of GHS Boomers David Gilmour signature series 10-48 strings, a complete set of stainless steel pickguard mounting screws, custom manufactured 4-¼" tremolo arm and a Switchcraft USA ¼" mono output jack. For a limited time we are offering a reverse angle bridge pickup in our Black 1 Ply 0.120’' Acrylic pickguard's with the standard 11 hole mounting pattern. Typically the bridge pickup on a Strat is rotated at a 10 degree angle in reference to the other two pickups where the treble E string pole piece is closer to the bridge than the bass E string pole piece. 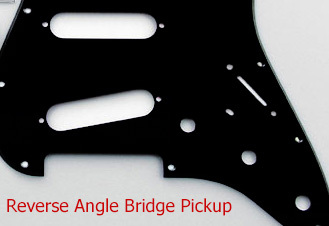 This unique pickguard's reverse angle bridge pickup is rotated the opposite 10 degree angle where the bass E string pole piece is now closer to the bridge and the treble E string pole piece is further away from the bridge. This would create a bridge pickup tonality the same as what Jimi Hendrix would of have experienced since he played a right handed guitar strung up and played left handed. This results in a reverse-angled bridge pickup with more high-end bite on the bass strings and a warmer sound on the treble strings. The tone of the middle two strings (D & G) will essentially go unchanged since there is very little change in their position relative to the bridge. Neck Pickup: The most popular selection for the neck position is the Fender® Custom Shop Fat '50. David has talked about his choice for this neck pickup that is installed in his Fender® Custom Shop signature series Black Strat in this interview video beginning at the 4:00 mark. An alternate neck pickup selection would be the Fender® Custom Shop Custom '69 which is more like the neck pickup in Gilmour's original Black Strat® which came from a 1971 Strat® when he changed the entire pickguard assembly in 1973. Middle Pickup: The authentic selection for the middle position is the Fender® Custom Shop Custom '69 and we don't offer any alternate selections. The Fender® Custom Shop Custom '69 pickup offers you a unique construction and vibe. These are the pickups that can deliver the coveted clear, transparent highs, thumping lows, and bleeding midrange response and feel that define electric guitar tone as we know it. These Fender® pickups are built using height staggered Alnico V magnets and a special gray bobbin. The Custom '69 is not Rw/Rp so you will not get hum cancelling in positions 2 and 4 like a modern Strat, this is normal for a Gilmour style Black Strat. It is only with our SSL-1C DG Rw/Rp bridge pickup will it provide some hum cancelling and it is described in detail below under the bridge pickup details. 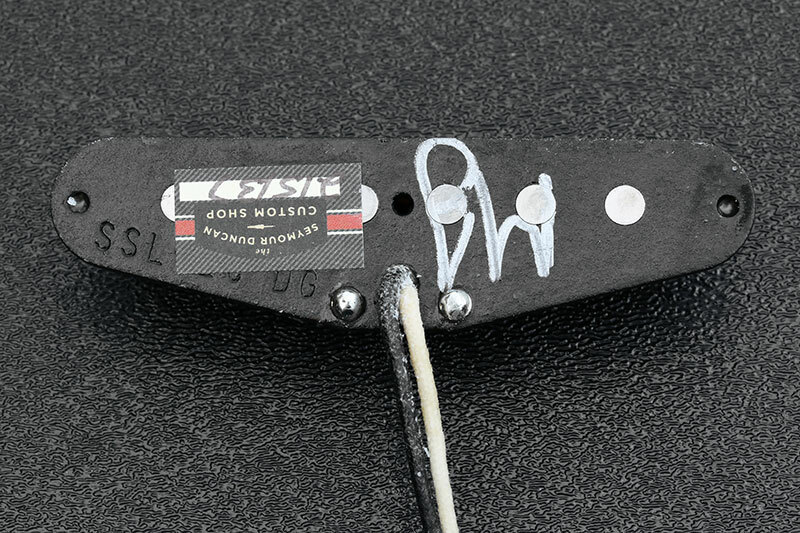 Gilmour installed the Seymour Duncan custom hand scatter wound SSL-1C pickup in the bridge position of his Black Strat® in Late 1979 and it has remained there ever since. We offer the SSL-1C DG pickup in two versions, both have the same tonality, output, harmonics and sustain. The SSL-1C DG is the same as Gilmour's original custom wound bridge pickup and the SSL-1C DG Rw/Rp is the same as the original SSL-1C DG pickup but in a Reverse Wound / Reverse Polarity (Rw/RP) version which will give you hum cancelling when the bridge and middle pickups are selected together or when the bridge and neck pickups are selected together using the recessed mini-toggle switch. You will find these pickups offered in the Bridge Pickup Selection option below as SSL-1C DG or SSL-1C DG Rw/Rp. Normally the Gilmour Black Strat® does not offer any hum cancelling capabilities in any of the pickup selection positions, this is an unique enhancement only we have incorporated into our design and components. For those Black Strat® purists you will probably want to stick with the original SSL-1C DG pickup, but for those that want a modern improvement over the original with a couple pickup selection positions of hum cancelling, then the SSL-1C DG Rw/Rp pickup would be perfect for you without sacrificing tone, output, harmonics or sustain. The SSL-1C DG Rw/Rp is an OverDrive Custom Guitar Works exclusive pickup, it is not available anywhere else. We have compiled a detailed information page specifically about our two Seymour Duncan Custom Shop SSL-1C DG pickups, read the full article here. 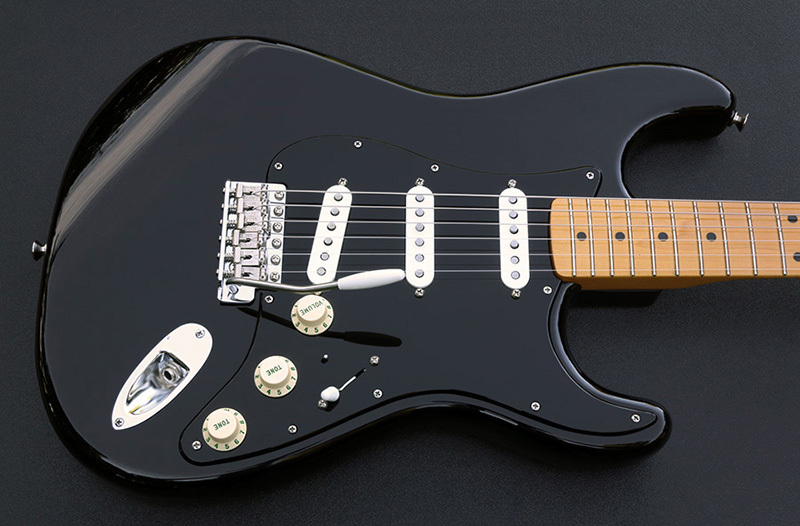 Gilmour installed the DiMarzio FS-1 pickup in the bridge position of his Black Strat® in early 1976 and continued to use it through late 1979. The DiMarzio FS-1 was used during the recording of Animals (album and touring), The Wall album and his 1978 solo album. The DiMarzio FS-1 is reverse wound and reverse polarity in reference to the Fender® Custom Shop Custom '69 in the middle and the Fender® Custom Shop Fat 50 in the neck so you get hum cancelling when the bridge and middle pickups are selected together and when the bridge and neck pickups are selected together using the recessed mini-toggle switch. 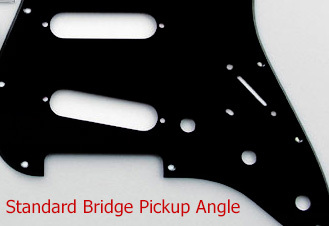 To have the correct visual appearance of the pickguard assembly from the late 1970's when the DiMarzio FS-1 was installed in Gilmour's Black Strat® the bridge pickup cover should be black, we offer that option in the bridge pickup selection below. The FS-1 is louder (about 25% more power) than a stock single-coil, and smoother and fatter-sounding all 'round. The FS-1 isn't designed with a vintage sound in mind, but if you're trying to get a blues sound from the bridge position of a maple-neck Strat, you'll be very happy with the extra mid's and bass, and the sound still cleans up when the volume is rolled down. If you opt to have the SSL-5 pickup installed in the bridge position keep in mind that its hookup leads will have to be reversed in order to keep it in phase electrically with both of the Fender Custom Shop pickups in the middle and neck positions. This reversal of the bridge pickups hookup leads is the same as what is being done on Gilmour's original Black Strat and both of the Fender Custom Shop Black Strat's. What this means is that the SSL-5's black (ground) wire will now have to be connected to the 5-way selector switch and its white (hot) wire will now have to be connected to ground. This reversal of its hookup leads corrects the phasing issue created by installing pickups that don't have compatible or matching coil winding direction. 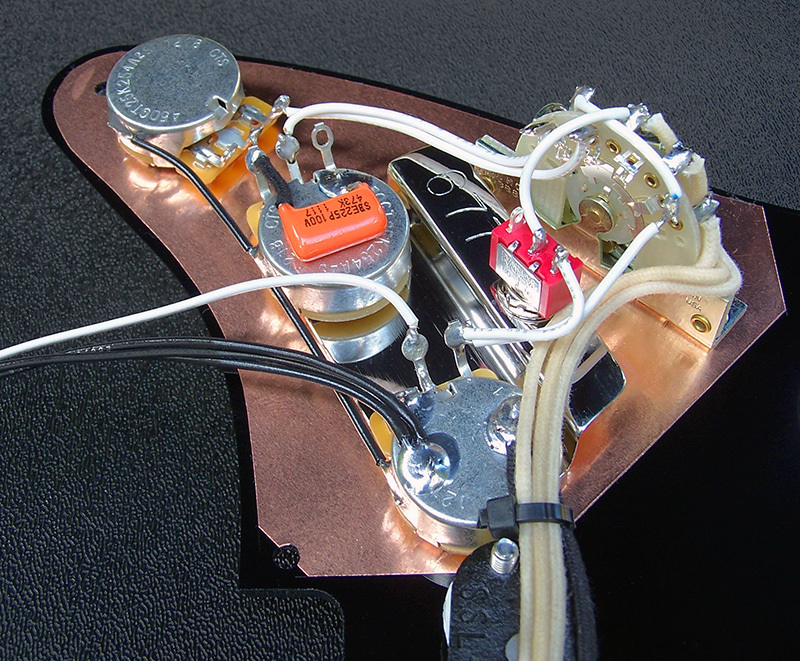 By reversing a pickups hookup leads to correct for electrical phasing it can cause other issues such as an increase in hum and also the pole pieces may become energized and if the guitar strings are pressed down to touch the pole pieces it will act as a kill switch and shut down the guitars output. This can be considered normal when a compromise is made by reversing a pickups hookup leads, but it is not desired, that is why we had both of the Seymour Duncan Custom Shop SSL-1C DG pickups created to be 100% compatible electrically and polarity wise to the two Fender Custom Shop pickups in the neck and middle position, neither of our SSL-1C DG pickups require any compromise of wiring by reversing their hookup leads. Accessories Color: We offer 5 accessory colors to choose from: White, Parchment, Aged White, Black and Combination. The Accessories consist of the pickup covers, volume and tone knobs, selector switch tip and the tremolo arm tip. 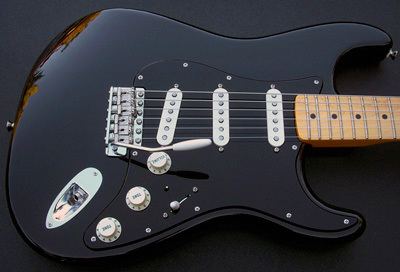 Parchment is the correct selection for a NOS style Black Strat®. Combination is the the correct selection for a RELIC style Black Strat® where the pickup covers, switch tip and tremolo arm tip are Parchment but the knobs are Aged White, also select Green Lettering for the Control Knobs Style. Control Knobs Style: We offer two styles for the appearance of the knobs in your pickguard assembly; STANDARD and GREEN LETTERING. The two Control Knob Styles are described below. With the STANDARD Control Knob Style, the knob set will appear brand new, exactly as they come from Fender® with their standard color lettering and numbering, no alterations or customizations. White, Parchment and Aged White Accessory Color knobs have gold lettering and numbering, Black knobs have white lettering and numbering. 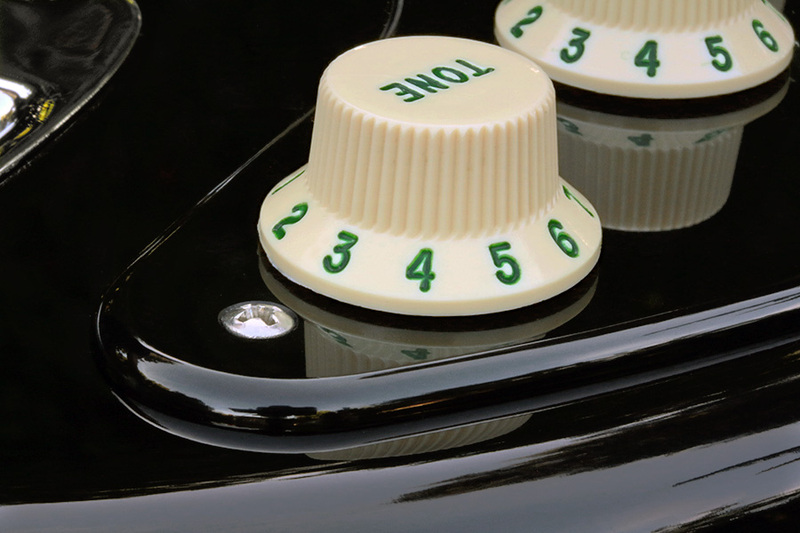 With the GREEN LETTERING Control Knob Style, the knob set will appear brand new, exactly as they come from Fender® along with the addition of the knobs being customized with the dark green lettering and numbering. The knob sets are customized in our shop with the dark green letters and numbers. This dark green coloring is a simulation of the natural patina or oxidation of the gold letters and numbers that would naturally occur over time with the old Strat® knob sets. 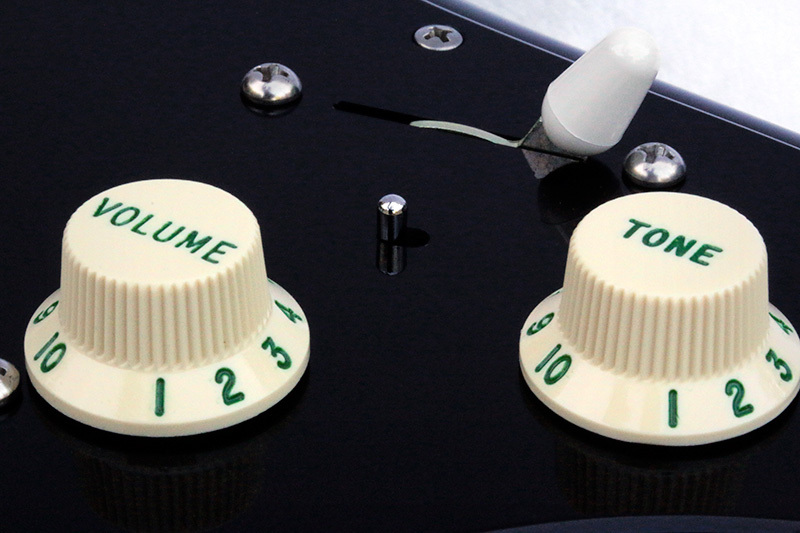 For an accurate representation of a RELIC Black Strat, select the Combination option for the Accessory Color along with the Green Lettering for the Control Knobs Style. The GREEN LETTERING option has a $28.00 up charge, selected and paid for additionally below. Tone Capacitor Value Selection: We offer 3 different tone control capacitors to choose from; 0.022 uF, 0.033 uF, 0.047 uF and 0.1 uF. Specific to the Gilmour Strat® would be the 0.047 uF tone capacitor. The typical tone capacitor found in most modern Strat's is the 0.022 uF which rolls off less treble as you lower the tone control where the 0.047 uF rolls off more treble as you lower the tone control. If you increase the value of the capacitor you effectively lower the frequency cut off point. As the tone control is lowered, the tone becomes deeper or bassier, because the cut off point has been lowered. This of course results in lower frequency signals being bled off to ground. Here is a link to a very informative video that explains How Tone Capacitors Work and is well worth watching to fully understand how tone capacitors effect your tone and to help you make an informed decision for the tone capacitor selection in your pickguard assembly. Here is another tone capacitor information page from Seymour Duncan, lots of good information here. Pickguard: All pickguard options are right hand versions only. For the authentic Gilmour style Black Strat® pickguard we custom manufacture in our shop the Black 1 Ply 0.120" Acrylic Pickguard with the Rounded and Polished Edge in both the Standard 11 Hole and the '57 Vintage 8 Hole mounting patterns. Both the Standard 11 Hole and '57 Vintage 8 Hole Black Acrylic 1 Ply 0.120" Rounded and Polished Edge Pickguards are copper foil shielded in the control region which is the same as Gilmour's original. The rounded and polished pickguard perimeter edge is only available with our Black or White 1 Ply 0.120" Acrylic pickguards. IMPORTANT NOTE ABOUT OUR ACRYLIC PICKGUARD THICKNESS: Our Acrylic pickguards are 0.120" thick (+/- a few thousands of an inch) so keep this pickguard thickness in mind when installing a 0.120" thick Acrylic pickguard on a Strat® with a 22 fret neck, make sure you measure the total amount of clearance you have underneath your 22'nd fret overhang and the surface of your body to ensure that there is enough room to accommodate the 0.120" thick Acrylic pickguard with at least a few thousands of an inch of extra clearance for breathing room between the top surface of the Acrylic pickguard and the underside of the 22'nd fret overhang. The vast majority of 22 fret necks and body combinations will work fine with our 0.120" thick Acrylic pickguards but we have seen a rare few that won't and will need some sort of adjustment for correct fitment. You DO NOT want to tighten down any neck where its 22'nd fret overhang makes contact with the surface of the pickguard, you could very well lift the fingerboard away from the neck by the leveraging forces of tightening down the neck. Details About How We Create Our Acrylic Pickguards: Each of our 1 ply 0.120” Acrylic pickguards with the rounded and polished edge are custom hand manufactured in our shop specifically for each customer. They start off being cut out of a sheet of Acrylic with a CNC laser which creates the basic pickguard shape with all holes and cutouts. We then create the pickguards round-over edge feature by hand with a table router where the pickguard is affixed to a routing template and we trim the pickguard to it’s final size and create the rounded perimeter edge. From there the pickguards rounded edge is hand sanded with a fine sandpaper to remove any tooling marks left behind by the router bit. The smoothly sanded rounded edge can then be polished with a special buffing wheel and a polishing compound used exclusively for Acrylic which creates the highly polished and glossy rounded edge. The pickguards mounting holes are then countersunk, copper foil shielding tape is applied to the control region and a final polishing of the entire pickguard is completed. It’s a fairly long process to create one of these unique pickguards, typically about 1 hour, but we feel that our final product is one that stands above the usual Strat® pickguard that has been produced the same way for over 50 years. This unique rounded and polished pickguard edge is available with our Black or White 1 Ply 0.120" Acrylic pickguards. Pickup and 5-way switch mounting holes are not countersunk and accept round head mounting screws. We also custom manufacture a White 1 Ply 0.120" Acrylic Pickguard with the Rounded and Polished Edge, it's just like the original Gilmour style Black 1 Ply 0.120" Acrylic Pickguard but this one is White. It comes standard with copper foil shielding in the control region. Click here for a photograph of a complete Strat with this White 1 Ply 0.120" Acrylic Pickguard installed. Illustrated to the left is a photograph of our Black 1 Ply 0.120" Acrylic Pickguard with the Rounded and Polished Edge depicting how the copper foil shielding is applied to both the Black or White Acrylic pickguards. Click here for a larger view of the control region copper foil shielding. 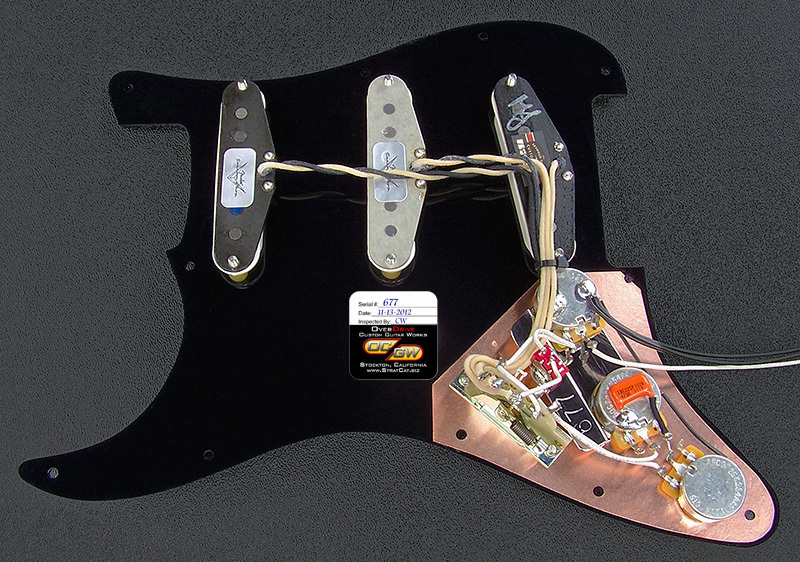 For those of you that may want more shielding than control region only copper foil for the Acrylic pickguards you might consider having the full coverage '62 aluminum pickguard shielding plate installed instead, you can include this type of pickguard shielding with "Add On" option #4 below. This full coverage aluminum shielding plate option has a $27.00 upcharge that is selected and paid for additionally below. This pickguard shield is customized/modified to accommodate the recessed mini-toggle switch and the modern 11 hole pickguard mounting pattern. By including this full coverage aluminum pickguard shielding plate on one of our four Acrylic pickguards they will not have any copper foil shielding underneath. Keep in mind that this full coverage '62 aluminum pickguard shielding plate is 0.012" thick, so remember to factor this too into your 22'nd fret overhang/pickguard clearance calculations if you are using a 22 fret neck along with our 0.120" thick Acrylic pickguards. Tremolo Arm: With each pickguard assembly we include one of our custom manufactured 4-1/4" stainless steel screw-in tremolo arms. Our short tremolo arms are available in 2 different attachment threading types; UNF 10-32 and Metric 5mm. The American Strat uses the UNF 10-32, the Mexican and Japanese Strat's use the 5mm. Below is a breakdown of the threading types or attachment type found on the various Strat® tremolo arms. If you are unsure of the the correct tremolo arm attachment threading for your Strat write us an email asking for assistance before placing your order. American Vintage, American Vintage Reissue, Highway 1, American Special, and American Standard Strat's (UNF 10-32). Mexican and Japanese Strat's 5mm (M5 x .8). Custom Stainless Steel Recessed Mini-Toggle Switch Mounting Bracket: For mounting the recessed mini-toggle switch that is used for turning on and off the neck pickup. 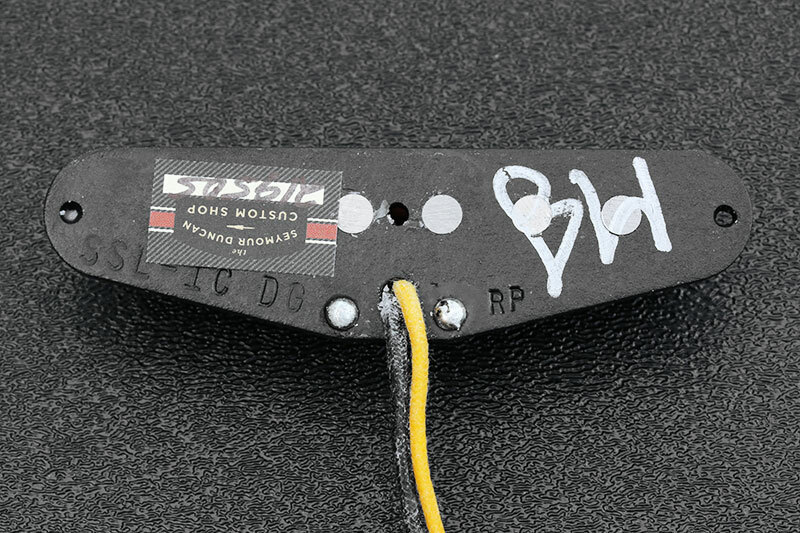 We serial number each of these pickguard assemblies and it is stamped permanently into this bracket. The serial number is sequentially incremental and represents the total number of these Black Strat® pickguard assemblies that have been built to date. Mini-Toggle Switch Recessed In Pickguard: This is what could be considered "The Gilmour Mod". It activates the neck pickup and is intended to be used when the 5-way switch is in positions 1 or 2. This expands the standard 5 pickup selections to 7. Volume and Tone Control Potentiometers: We use CTS 450G series (450GT25K254A2L), 250k, 10% tolerance, 10% audio taper, low rotational torque potentiometers for our volume and tone controls. These high quality CTS potentiometers have brass shafts and brass mounting bushings. Pickup Selector Switch: CRL 5-Way. The best 5-way selector switch available, made in the USA. Mounting Screws: We include enough screws for an entire Strat® to mount the pickguard, output jack plate and tremolo cover plate. 19 screws if you order an 11 hole pickguard assembly or 16 screws if you order an 8 hole pickguard. Switchcraft USA ¼" Mono Output Jack: An industry standard when it comes to the best output jack available, that is why we include one with our pickguard assembly package to ensure you have a solid link between your guitar and cable to your amp. Set of GHS Boomers David Gilmour Signature Series Strings (Blue Set): Since you're building an authentic Black Strat you'll want a set of these strings as well, that's why we include a set with each pickguard assembly. If you select the SSL-1C DG Rw/Rp pickup you must include "ADD ON" Option #1 below to pay the $71.00 upcharge. If you select the SSL-1C DG (Original) pickup you must include "ADD ON" Option #2 below to pay the $71.00 upcharge. If you select GREEN LETTERING you must include "ADD ON" Option #3 below to pay the $28.00 for the customization. Use the above "Add to Cart" button for the pickguard assembly options selected above. Below are the pickguard assembly "ADD ON" upgrade payment options. They are used in addition to the above selections. #1 + $71.00 - Upgrade the Installed Bridge Pickup to the Seymour Duncan Custom Shop "SSL-1C DG Rw/Rp". #2 + $71.00 - Upgrade the Installed Bridge Pickup to the Seymour Duncan Custom Shop "SSL-1C DG" (Original). #3 + $28.00 - Upgrade the Installed Knob Set with the Customized GREEN LETTERING and NUMBERING. #4 + $27.00 - Upgrade the pickguard shielding to the Full Coverage '62 Style Aluminum Shielding Plate. For '57 vintage 8 hole pickguards that are not shielded as they are manufactured by Fender. For '59 vintage 10 hole pickguards that are not shielded as the are manufactured by Fender. For '62 vintage 11 hole pickguards that are not shielded as they are manufactured by Fender. Can also be used to fully shield our 8 and 11 hole Black 1 Ply 0.120" Acrylic pickguards that are normally copper foil shielded in the control region. If you select this shielding option for your Acrylic pickguard it will NOT have any copper foil shielding. Acrylic pickguards are more fragile than the typical vinyl ones most people are familiar with. Always use the utmost of care when installing components into an Acrylic pickguard, never tighten any fastener too tight and never tighten any perimeter mounting screw any tighter than just to the point where the screw barely snugs the pickguard or back plate down to the surface of the body. Never flex or put undue pressure on any part of the Acrylic pickguard or you risk the very real possibility of it breaking. Occasionally we find very small cosmetic imperfections in the surface of our Acrylic pickguards, typically they are small bubbles or spots and sometimes thin lines, but is not limited to these types of imperfections. These are not something we consider as defective since they are an effect of the Acrylic casting / handling process. Unfortunately we cannot determine if any Acrylic pickguard is going to have any of these imperfections until the entire pickguard manufacturing procedures are complete, so there is no way to pick and choose a "perfect" pickguard for a project beforehand. For the most part it's a non-issue and inconsequential and we will never let any pickguard go out that we feel has any undesirable characteristic that is obviously unacceptable. We've made over a thousand of these pickguards and some have these characteristics and no one has yet felt the need to complain. With that being said, we just felt it was best to make sure you were aware of these possibilities to avoid any surprises. All custom built pickguard assemblies are not eligible for return, refund or exchange due to the unique nature of the customized options you select for your particular assembly. Each pickguard assembly is custom built on an “As Ordered” basis for each individual customer with their specific and unique assembly options selected at the time of purchase. Typical turn-around time from order placement to shipment is up to 21 days. Holiday work-loads may increase turn-around time. Some import Strat's (MIM, MIJ), Squier's or "Look-Alike" Strat® bodies may not be 100% compatible with the pickguard perimeter mounting holes and some adjustment may be needed on your body. Our custom manufactured Acrylic pickguards have the same perimeter mounting hole pattern as genuine American Fender® Strat® pickguards, so as long your body mounting holes line up with those, then you should not experience any problem. Each of our complete Strat pickguard assemblies are built using components to fit genuine Fender® Strat's®, this does not include some Squier® by Fender® Strat's®, some Squier® Strat's® may have incompatibility issues in the mounting hole patterns and control cavity routing depths and styles as well as overall body thickness incompatibilities. So if you have a Squier® by Fender® Strat® do your research before purchasing any of our complete pickguard assemblies to ensure that our assemblies will be compatible with your particular model of Strat®. Both of the above two Acrylic cleaning products can be purchased from a company called Tap Plastics. Here is a direct link to the item page for the Kleenmaster Brillianize and here is a link for the Novus #1. This pickguard assembly is not endorsed by David Gilmour or Fender Musical Instrument Corporation. It is offered here as a high quality replica based on our research. A very common occurrence we find with most Genuine Fender® pickguards are some sort of minor blemish or imperfection in the surface of the pickguard. After many years of being in business building complete Strat® pickguard assemblies using Genuine Fender® pickguards we find these blemishes far too often when we build a new pickguard assembly. Most are relatively minor, insignificant blemishes, but unfortunately we can't sort through a stack of pickguards with hopes of finding one without any blemishes, so it is possible you may find some slight blemish in the surface of your completed assembly and it is not something we can consider as cause for replacement. However, we will not use a pickguard for an assembly that has a large number of blemishes or a significant imperfection, but a few small ones are considered a normal characteristic of the current/imperfect manufacturing process. Even as Fender® builds their brand new Strat® guitars, they're built with the pickguard still having its clear protective film affixed to the pickguard surface and it will eventually only be known to the purchaser of the guitar if any blemishes are present once they remove the protective film since you can't see them through the clear pickguard protective film. Bottom line is that Fender® is building complete Strat® guitars with the same pickguards we are using and they don't find cause for alarm with some imperfect characteristics or blemishes in their complete guitars, but we just wanted to make sure that you are fully aware of the things we have to consider and contend with when we build your complete pickguard assembly.